- Come In And Check It Out!! - It can be played with one or two players per side (singles or doubles). - The court is smaller than a tennis court. - Speed of play increases because of the smaller playing surface. 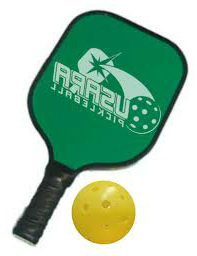 - Played with a solid wood or composite paddle that is larger than a ping-pong paddle but smaller than a tennis racquet. - Games are usually to 11 points (win by 2) and points can only be scored by the serving player.